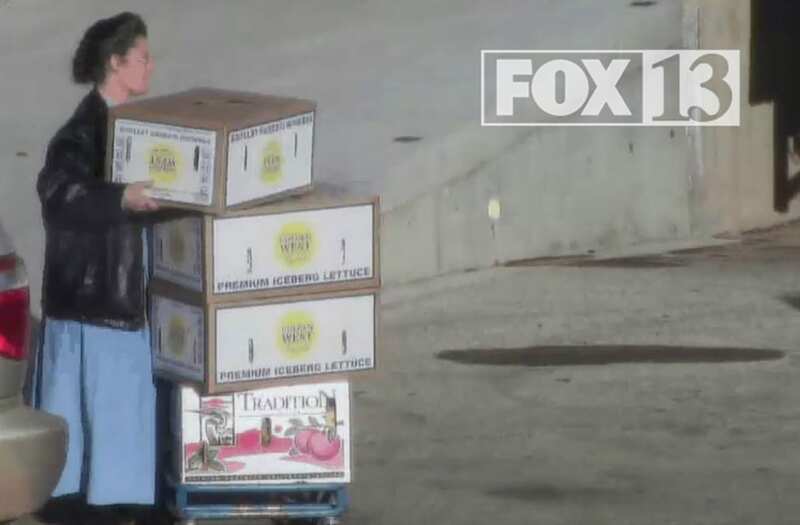 SALT LAKE CITY (KSTU) -- The woman pulls up to Meadowayne Dairy in Hildale and walks in, spending a few minutes picking up some items and hands the clerk a list. Having depleted her EBT card, the FBI claims, the woman walks out with a small bag and gets in her car. A drone follows her as she drives from the store to a Bishop's Storehouse run by the Fundamentalist LDS Church. There, another hidden camera captures her giving her items to another FLDS woman who loads it into a shipping container. Clips of the FBI surveillance videos, obtained by FOX 13, show a number of instances the federal government alleges was food stamp fraud perpetuated by leaders and members of Utah's largest polygamous church. The FBI recorded hundreds of hours of video using hidden cameras smuggled into FLDS-run stores, hidden outside the stores and a drone that tracked vehicles around the border towns of Hildale, Utah, and Colorado City, Ariz. The video, alongside documents and interviews with ex-FLDS members, made up the bulk of the government's case against church members. Surveillance video shows what the federal government alleges was a food stamp fraud perpetrated by leaders and members of Utah’s largest polygamous church. Lyle Jeffs, the brother of FLDS leader Warren Jeffs and considered the one who orchestrated the fraud case, is scheduled to be sentenced Wednesday morning in federal court. Lyle Jeffs was a fugitive for about a year after slipping out of a GPS monitoring device. He was arrested in June in South Dakota. In a ruling issued Tuesday, U.S. District Court Judge Ted Stewart said he was considering a prison sentence of anywhere from four to five years. The judge also slashed the amount of Supplemental Nutrition Assistance Program fraud he believed Jeffs was responsible for. The U.S. Attorney's Office for Utah claimed in a filing it was more than $11 million. Judge Stewart suggested the number was inflated and put the loss amount in Jeffs' case at $1.5 million. Jeffs' sentencing brings to an end what was once considered the nation's largest food stamp fraud case. Eleven FLDS members and leaders were charged after a raid in the border towns. Almost all of them took plea deals. "Along with fraud and along with many areas of imposition financially on the people, there was also a lot of internal, personal family conflicts created damaging beyond repair," said Dowayne Barlow, an ex-FLDS member who was also a witness in the case. "I think that Lyle was a pivotal individual. The corruption of the Jeffs' in that community was unbelievable," he added. "Lyle could have turned the tide on that. I think everybody gets where Warren stands, that he was out of control and not personally clean or moral. Lyle perpetuated this issue." Other ex-members of the FLDS Church have criticized the federal government for not being aggressive enough on the case. The FLDS defendants argued a religious right to consecrate all they had to their church, and the judge did allow that defense to be admitted at trial. The government countered that SNAP benefits are for household use only. The First Amendment religious freedom argument was viewed as a tough hurdle for the government to overcome with a jury. In previous interviews, the U.S. Attorney's Office for Utah has said it could not visit all the sins of the FLDS Church on this case. Still, Barlow said he believed the government did accomplish what it set out to do. He told FOX 13 on Tuesday he believed the food stamp fraud had been curbed within the FLDS communities. "I think it's been curbed substantially and now it belongs to the people to take responsibility for their cases and their own compliance with it," he said.